Thursday a lone chickadee decided to do a little spring cleaning in one of the wren houses. Thick clouds were moving in, ahead of a line of heavy rain, and the little bird seemed aware that there wasn’t much time for nest clearing. It made trip after trip into the house, sometimes tossing wood shavings straight out through the door, sometimes carrying them several feet away and scattering them in the honeysuckle. When the rain arrived, the chickadee kept working a while longer, then it gave up and moved into the cover of the wax myrtles. 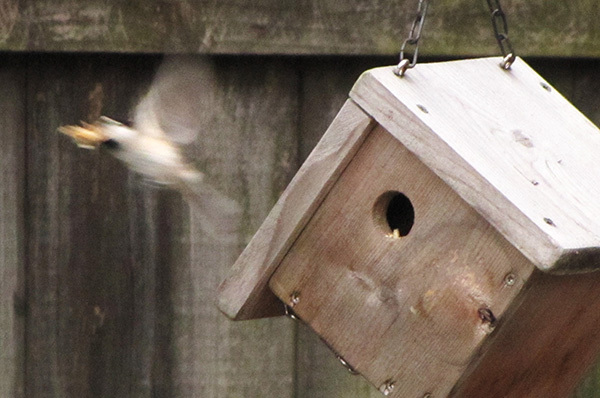 As Thursday’s rain cycled into a dreary, cold Friday, I kept watching for the chickadee to return. 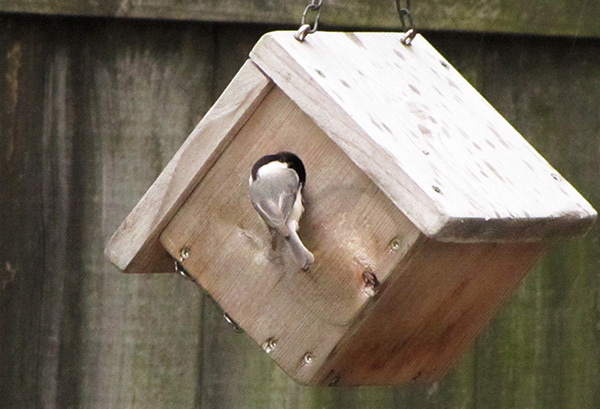 But there has been no sign of further interest in the nest box. On Saturday I left the yard’s mysteries to take care of themselves while I attended Coastal Crime Fest 2015. This single-day writing conference was sponsored by Mystery by the Sea, The Southeastern Virginia Chapter of Sisters in Crime. The day’s sessions included mystery authors talking about writing and publishing, tales of real-world experience from a retired FBI agent, and a presentation about situational awareness from a pair of self-defense instructors. I’m already looking forward to next year’s conference. What’s more, Saturday’s conference was not my first writing event this month. Last weekend I attended one of the Hampton Roads Writers’ Traveling Pen Series, a morning-long workshop about paranormal and fantasy writing. The workshop included several very helpful writing exercises, and I was excited to learn that the guest speaker, Vanessa Barger, will be presenting more workshops at the Hampton Roads Writers’ 2015 Conference in September. I admire your interest in different genres. Just read several poems by Mary Oliver, sighing over her brilliance, wishing I had the nerve to write poetry.